Diane knits, crafts cards, and bakes! 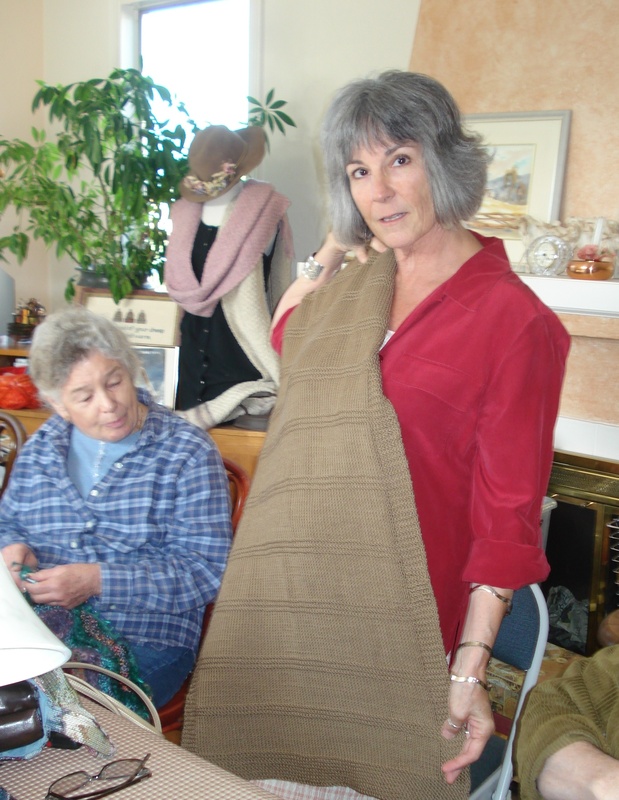 Diane recently finished her second baby blanket for a new addition to her boyfriend’s extended family. Her first was her rendition of the Moderne Baby Blanket. Her second baby blanket was another joy to knit…simple, quick and charming. I asked Diane for the details this evening. Her answer is at the end of this post. Isn’t it fun to see Eleanor admiring Diane’s work? It is truly a joy to witness how appreciative and supportive other knitters are of each other. Not only does Diane knit…but she crafts cards! Here is the card that accompanied this baby blanket. Diane’s professional history includes that of being a pastry chef. That talent continues with her…right now she is crazed beyond belief with baking…she even gave up a few evenings of knitting to bake for this spiritual season. Note the response below! And now Diane’s response to my request for info. “I got the pattern from “Natural Knits For Babies and Moms” by Louisa Harding. It was the Blanket and Hat on page 39. I chose it because it looked to be small enough for me to finish it in a short time. The width was for 18” and length 24”. I made it longer, and I would have made it wider if I had been thinking about it. The yarn was Merino 5 by Crystal Palace Yarns. It was a 100% Superwash Merino Wool. The pattern is very simple but pleasing to the eye. I did get the impression she loved it and appreciated my effort. I made the hat that went with the blanket, and I really did not like how I joined it, as I didn’t have my instructions with me to seam it, but I gave it anyway..figured the baby would out grow it very quickly! My card making started about 5 years ago with Sally, and we still try to get together to make cards about once a month. The cards I make seem to be always so well received, and make me look like I am very creative, even tho it’s done with a template for the center. 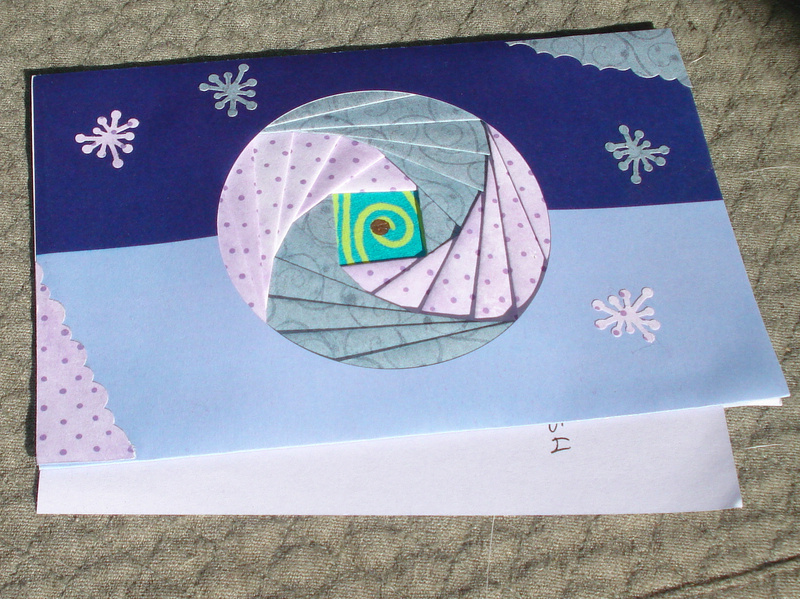 Anyway, I do love being able to use hand made cards as part of the gift. Tomorrow I will tell you about my next major knitting ventures! Diane, everything is beautiful! I especially love the cards. I know how you make those and I am here to tell you they require precision and attention to detail. They are VERY cool. I would love to get together with you and your friend to make cards sometime. I am always making mine all by my lonesome!!! And when do I get to try some of your baking?? ?